With 23 events on the TriniChow foodie calendar, October is a fantastic month for food lovers in Trinidad & Tobago! Be sure to mark your calendars for T&T’s biggest foodie events in October — the 2012 Blue Food Festival in Tobago, Trinidad’s Brasso Seco Cookout Fest and Tobago’s celebration of World Food Day! Wednesday, Thursday, Friday & Saturday, October 24-27, Annual Wine Sale at Vintage Imports (Woodbrook & San Fernando, Trinidad and Carnbee, Tobago). “Fabulous wines and liqueurs unbelievably discounted! Just in time to stock up on your favourite brands right before the Christmas season!” Link to event flyer. 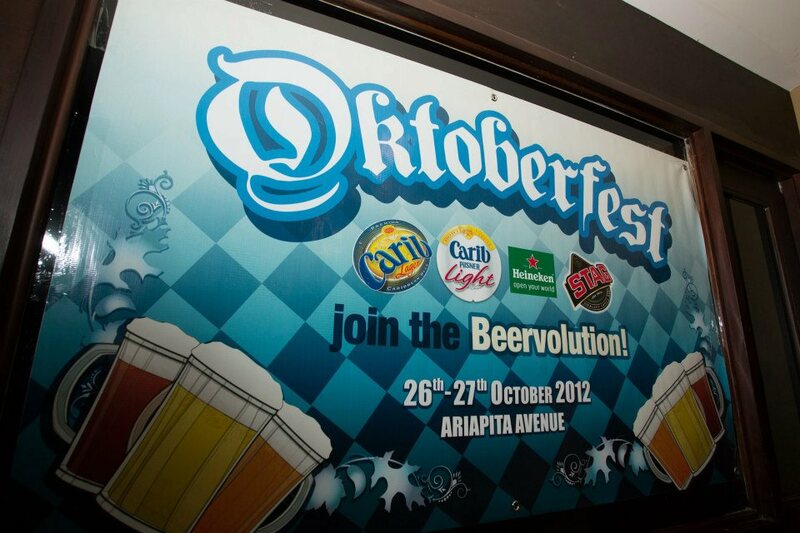 Friday and Saturday, October 26-27, CARIB BREWERY OKTOBERFEST at Adam Smith Square on Ariapita Avenue. “Oktoberfest Village • Draft Beer • German Foods • Live Bavarian Folk Music • Steelpan • Tassa and more!” Friday: 6pm-12am and Saturday: 4pm-12am. Link to Facebook event listing. FREE ADMISSION. Saturday, October 27, 9am-6pm, THE ULTIMATE EPICUREAN & BOUTIQUE MARKET at the Crowne Plaza Hotel (Port of Spain, Trinidad). Link to Facebook event listing for the market and flyer. FREE ADMISSION. Saturday, October 27, Chef’s Table Dinner with Chef Paul Mowser at Fanatic Kitchen Studio (Port of Spain, Trinidad). Enjoy a five-course seafood and wine paired dinner for $750 per person all-inclusive, for bookings email info@fanatickitchenstudio.com or call (868) 681-9643. SUNDAY, OCTOBER 28, 2012 BRASSO SECO COOKOUT FEST at the Brasso Seco Visitor Facility (Brasso Seco, Trinidad). “Enjoy indigenous foods, music and culture in the beauty of the Northern Range rainforest!” This cookout fest treats guests to mouth-watering Buccaneer smoked meats, homemade pastelles, sweets and ice creams, Brasso Seco estate creole cocoa and coffee. Events include the Buccaneer smoked meat demonstration, local parang and cultural performances. Food will be on sale from noon and the demonstration will also occur then.” FREE ADMISSION. Saturday & Sunday, October 20th & 21st, T&T FISH FESTIVAL (Salybia & Matura, Trinidad). “The North Eastern Coast community will come alive with a weekend of activities that includes a seafood culinary competition (Saturday 7am-7pm), cultural street procession, pirogue regatta, all fours’ competitions,the Miss T&T Fish Festival and culminates with the grand concert featuring triple Monarch Winner Machel Montano and Prince of Reggae Jah Cure.” Link to event flyer on Facebook. Saturday, October 20, 10am-4pm, Organic Farmers’ Market at Be Free Foods (St. James, Trinidad). Be Free Foods, an organic grocer, is hosting a organic farmers market featuring local farmers selling their prized produce. Expect to find items like organic christophene, figs, callaloo, cocoa, herbs, Summer Crisp and Butterhead lettuces, and more. FREE ADMISSION. WEDNESDAY & THURSDAY, October 17th & 18th, TOBAGO’S WORLD FOOD DAY. One of our favourite culinary events, Tobago puts on fantastic World Food Day exhibition, showcasing local foods, produce, plants and live stock from villages throughout the island. (Prepared food, fruits, vegetables and plants are available for purchase and there’s live entertainment.) FREE ADMISSION. SUNDAY, OCTOBER 14, 10am-6pm, TOBAGO BLUE FOOD FESTIVAL in Bloody Bay. Don’t miss Tobago’s dasheen fete! Chefs from Parlatuvier, Bloody Bay, L’Anse Fourmi will whip up savoury and sweet dasheen dishes for blue food competitions, cooking demonstrations and displays. Favourite local dishes and beverages will also be on sale, and live entertainment will be on hand. FREE ADMISSION. Link to Pictures from 2012 Tobago Blue Food Festival. Saturday, October 13, THTI STUDENT DINNER (Italian) at the Tobago Hospitality and Tourism Institute. Reservations start at 7pm, call (868) 660-2196 or email marketing@tobagothti.com to book. Saturday, October 13, 10am-4pm, UPMARKET SOUTH at Oasis (101 Circular Road, Mon Repos, San Fernando, Trinidad). UpMarket – Trinidad’s favourite foodie and artisan market – is back in South. Check the UpMarket Facebook page for directions. FREE ENTRY. Wednesday, October 10, 4pm-6:30pm, AFTERNOON TEA at The Vernadah (St. Clair, Trinidad). $128 per person exclusive of tax & service charge). Saturday, October 6, 9:30am-3pm, UPMARKET at Woodbrook Youth Facility (Woodbrook, Trinidad). Walk with your grocery bags and cash for Trinidad’s premier gourmet market featuring local food artisans, caterers, chefs, farmers alongside artists and other vendors selling jewelry, soaps and lotions, art and much more. FREE ADMISSION. RELATED LINK: Culinary Festivals & Events in Trinidad & Tobago! Don’t miss our list of Restaurants in Trinidad & Tobago with BUFFETS!